My bulbous belly has not only brought me sore ribs and a sleep cycle that is more akin to a wash cycle than sleep, it has also awakened in me a new found appreciation of citrus. Pre-baby bump I was not particularly impressed by the dimpled coral skin of Oranges and even less so by its less eaten cousins, Lemon and Lime. In fact, unless a recipe called for their bitter skins or mouth-puckering juices, they rarely mingled with the other fruits in my bowl. Until now. At first it began with a slice of lemon in my water. Then my fingers found themselves tearing mandarin segments apart to nibble with my morning toast. It wasn't long before I was squeezing chartreuse droplets over my salad leaves and grating orange zest into my pancake batter. Before I knew it, I was a citrus-holic; my vitamin C levels have never been better. prep time: 6mins (but you need to soak the tapioca overnight). cooking time: 10mins (I cooked bananas whilst tapioca was cooking). taste: 4/5. Amazing melding of asian flavours. Overall this flavour combination is complex and exciting. The porridge itself has the smooth notes of vanilla, creamy tropical coconut and the fragrant fruity kaffir lime. When paired with the sweet caramelised banana and sharp tang of lime juice it really makes a winning combination. The tapioca pearls add a nice chewiness to the dish. Whilst I loved it, hubby had one mouthful and decided it wasn't for him, blaming the coconut and texture of the tapioca. But his bowl didn't go to waste, my dad happily polished it off for him. would I make it again: No, only because hubby won't eat it. A delicious combination! Tapioca pudding is so addictive. Looks delicious and I love that combination of flavors! Sorry your husband wasn't a fan. You should make it for yourself sometimes as a treat anyway -- if I only ate what my bf liked it'd be very narrow indeed =). Beautiful recipe. You had me at brown sugar bananas. I find I go through citrus 'cycles' - there are times when I have to squeeze some lemon or lime into everything, and times when I get a bit 'over it' (I guess the wintery vibe doesn't help). 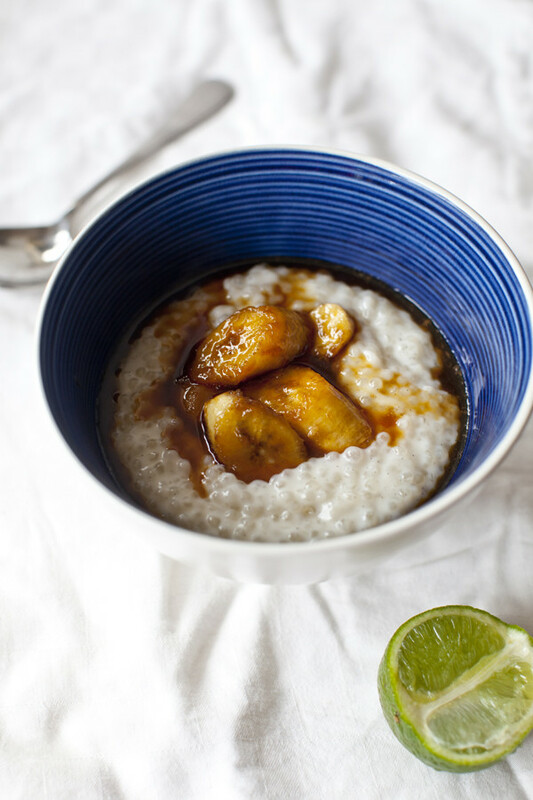 This dish sounds yummy and unusual - the brown sugar bananas would work a treat in my house!